A quick and easy dish, Pasta Ham and Broad Bean Salad, is the best option for working people or ones with a busy schedule. Additionally, this pleasing and sustaining dish is nicely complemented by watercress and walnut pesto dressing. The rich dressing also adds flavor to the Pasta Ham and Broad Bean Salad. This salad is filling, light in calories and flavorsome as well. First of all cook the fusilli pasta in a large saucepan by following the given instructions on the packet. Otherwise, add the pasta to lightly salted boiling water and cook for 8 to 10 minutes. Now, add in the broad beans and boil them. Reduce the heat of the stove and cook the pasta-beans mixture for 2 to 3 more minutes or until tender and lightly cooked. In the meantime, take a bowl and place halved tomatoes, diced lean cooked ham, and chopped fresh chives in it. Top the ingredients with extra virgin olive oil and toss them well. Set this mixture aside. Drain the cooked pasta-bean mixture properly and place it on a large serving platter. Add in the previously mixed tomato-mixture and toss them gently without breaking the pasta. Take an electric food processor or blender and place the watercress leaves, chopped walnuts and garlic in it. Process or blend the ingredients until finely grounded. Add in the remaining oil and pulse and blend for a few more seconds. Pour in the lemon juice and yoghurt during the last few seconds of blending. Remove the jug of the blender or food processor and pour the dressing into a bowl. Season the dressing and set aside. Drizzle the dressing over the salad in the platter and toss very gently. 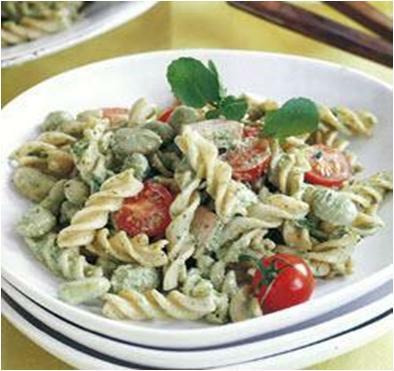 Serve your Pasta Ham and Broad Bean Salad and enjoy!